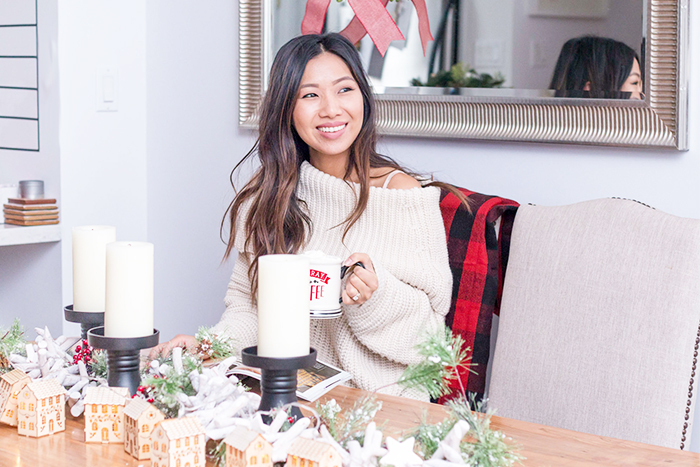 My interpretation of a Canadian Christmas is extremely inviting, filled with warm colours of red, fresh evergreen wreaths and cozy plaid blankets! 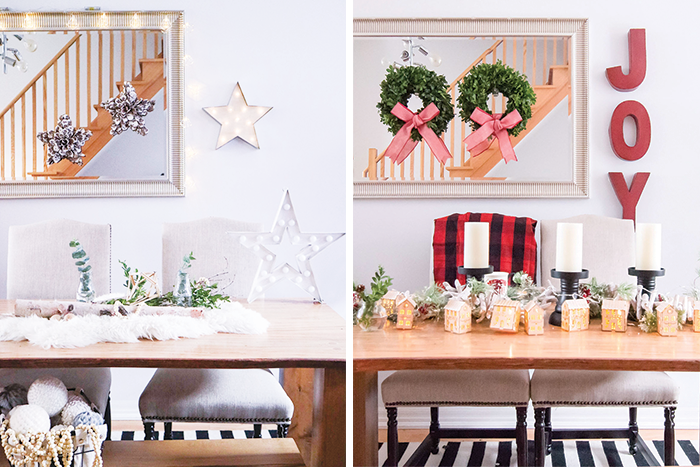 With that in mind, I proceeded to do a super easy holiday decor flip thanks to Command® Brand and the versatility of their products. It was painless and only took less than 15 minutes to achieve, which means more time to sip of hot chocolate and watching my favourite Christmas movies! 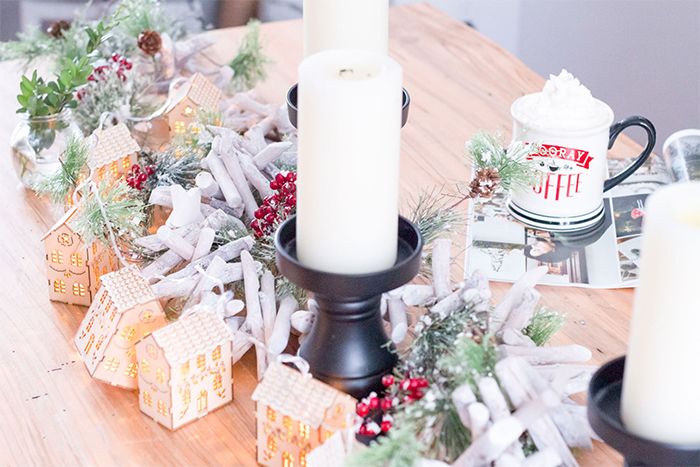 Since I had an inkling that I would be transitioning my original holiday style to a more traditional vibe, I enlisted the help of a few Command® Brand products knowing that it would not only save me time but also allow me to move a few things around without causing any damage to my walls or furniture. 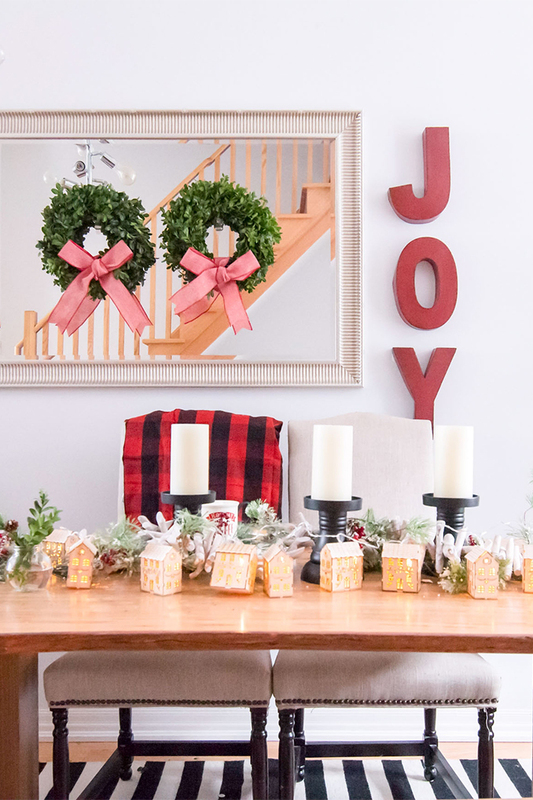 In my first decorating phase, I primarily relied on Command® Brand Clear Decorating Clips to hang my delicate string lights and Command® Brand Medium Picture Hanging Strips to hold up various floating items on the wall. During my decor flip, I was able to remove the affixed items on the wall with a breeze. I decided to leave the Clear Decorating Clips in place despite removing the string lights because they are barely noticeable! Before I replaced the star marquee sign with the new “JOY” sign I purchased, I had to remove the existing Picture Hanging Strips from the wall. The removal process was super simple. I just followed the instructions to pull the strip downward, and that was it! To hang the letters, I used the same approach by utilizing the picture hanging strips. I recommend the Command® Brand Picture Hanging Kit as it contains an array of strips and hangers in different sizes, giving you the most options to choose from. I absolutely love the look and smell of fresh wreaths. To add an extra dose of sophistication, I chose to use fresh boxwood this year. I brought home two smaller sized boxwood wreaths instead of one giant one, and tied two pretty bows made from a roll of wide ribbon. Since these wreaths were more delicate, I wanted to avoid using wreath hangers. Instead, I used two Command® Brand Large Crystal Hooks to do the trick. Each one of these hooks holds approximately 4lbs. It offers the same versatility and ease of use as all the other Command® Brand products but I particularly love these hooks because they are stylish and decorative! I’ve even used several of these in my mudroom to hold coats and hats! 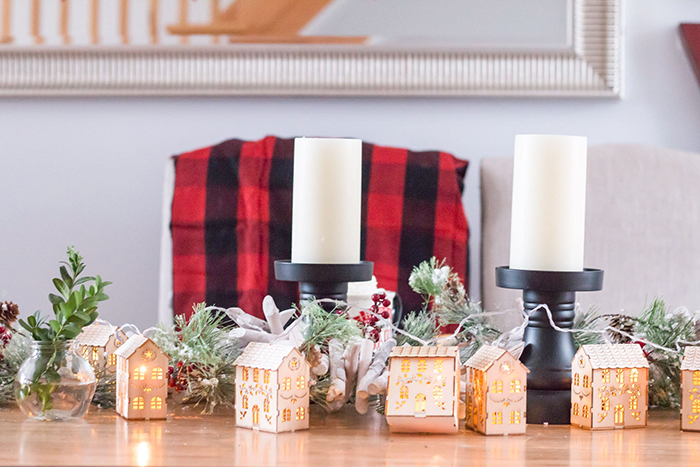 To complete my vision, I swapped out the faux fur and natural wood trimmings from the tabletop with large sized candles, a decorative Christmas themed garland and a set of adorable mini-house string lights. The transformation was incredibly achievable and I must say, the house is definitely looking more and more like Christmas is upon us! Head on over to my Instagram account to watch a video on this easy transformation! Disclaimer: This post was sponsored by 3M, but all opinions and ideas are my own. Command® Brand offers so many other indoor and outdoor appropriate products that you absolutely need in your holiday decorating kit! It’s just irresistible! With the coming holidays!